You know what Erasmus said? 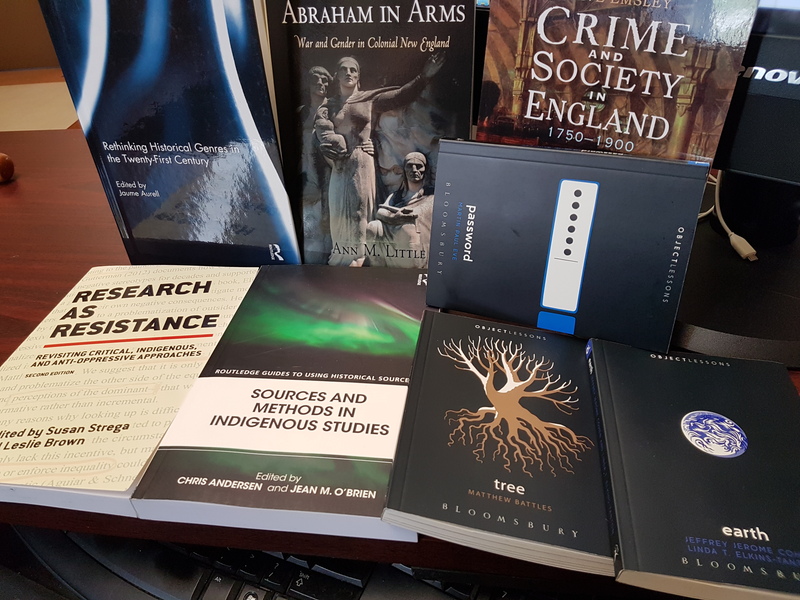 “When I have a little money, I buy books; and if I have any left, I buy food and clothes.” Well, I bought another bunch of academic books this month. Eight in print depicted, one still on the way and one ebook awaiting me on my ereader. Oops? This fall term I’m teaching a bunch of familiar courses: Western Civilization from the Renaissance to the French Revolution, Crime and Punishment in England, 1500-1900 and then our graduate course on research methods which is going interdisciplinary across the humanities thanks to the wonders of cross-listing. With that in mind, I’m expanding my mind and my reading list particularly as it comes to the last element. In between writing up my crime history research in hopes of having another article complete this summer, I’m reading in order to lead a wide-ranging class of students on the start of their own research journeys. However, on the heels of presenting at Congress 2017, I’m taking the rest of this week as a bit of a vacation. The scholarly reading goes on hold but it’s hard when the books are so tempting. . . .